Habitat loss remains the main driver of extinct species, but it may act synergistically (i.e. reproduction-reduction – PZP use for example or hunting under falsified habitat population information) with other drivers such as over harvesting and pollution of habitats, and what is currently ongoing — climate change. Large-bodied species such as Wild Horses, rare species, and habitat specialists (unique biosphere living) are particularly prone to extinction as a result of rapid human modifications of the planet. Extinctions can disrupt vital ecological processes such as pollination and seed dispersal, leading to cascading losses, ecosystem collapse, and a higher wildlife extinction rate overall. Agreement that wildlife extinction rates have increased over the past few decades is quite common, and undisputable facts exist. Wildlife extinction is from adverse accelerated habitat; profound wildlife breeding control and reduction methods (for example with PZP, the methodology more popular than being useful, and in reality has no significance other than leading to ultimate extinction); and, global expansion of the human population during the twentieth century. diseases, and blatant habitat destruction both human-made and invasive species introduced negligently . . .
BLM erroneous horse counts contributes to “closure rates”, as it is estimated that, e.g., cattle and sheep on Public Lands outnumber the wild horses – 10.6 : 1 ratio, and after discussion find it to be the minimum average, a much higher average, according to scientific estimation and a ratio more in-line with cattle and sheep populations on America’s Public Lands is 38.4 to 1 ratio. A key-element here: Ultimately, any phenomena that can cause mortality rates to exceed reproductive-replacement, over a sustained period, cause species extinction. The Rocky Mountain Sheep placed on Mount St. Helen’s months before the mountain erupted, a good example of this area-extinction development. The introduction in 1996 of PZP within the Wild Horse population on Public Lands, then redefined, upon past use – then used currently to lead the way for Wild Horse population extinction, and promoted under false pretense and use . . . In reality, many forces contribute toward habitat loss which leads to extinction, in the Wild Horse case — a build up of cattle and sheep on Public Lands, with extreme ratios of cattle and sheep compared to horse population. This will cause extinction of the wild horse directly, for several reasons. Then we compound the situation with reproductive reduction in breed-controls . . . or what is termed Reduction to Extinction. In our case scenario here, the BLM not only removes many of America’s Wild Horses, but plans have been discovered, over time, that the BLM, along with the Department of the Interior and the Wild Horse and Burro Board are all, along with many of what is termed Welfare Ranchers and miscellaneous corporations — will be responsible for the absolute extinction of America’s Wild Horses off of America’s Public Lands – despite what American’s want. The BLM, along with their contractors and special interest groups, manipulate material and data favorable only to these special interest groups. They communicate to the public with lies and innuendo; which, equates to misinformation to the public. This, in reality, is to promote the liquidation via reproductive-reduction of Wild Horses the extinction process, rather than a population-control process, as promoted, toward longevity of wild horses — which is the outright lie . . . as well as a tremendous amount of taxpayer money spent for such criminal behaviors and conduct – Creating fraudulent budgets based on lies and misinformation is illegal after all . . . and many question why this criminal behavior is ignored. . . In summation: BLM and DOI, via Special Interests at taxpayer expense, facilitate the establishment of an invasive species (cattle and sheep) by using a registered Pesticide (PZP) — given to Wild Horses under the status of “Pest” – and this registered Pesticide agent is used for Reproduction Reduction Process = Extinction, and is also an agent of questionable use and very questionable history due to lack of any quality research methodology. As a result, any one of these process agents can and does cause a population to dwindle. Ultimately to predispose this same population, in this case America’s Wild Horses, to a zeroed-out population = EXTINCTION! As well, the heavy false promotion and awkward at best use of the Registered Pesticide PZP for direct Reproductive Birth-Rate Reduction in the wild horse herd populations over all. Promotion toward a mere and wholesome population-control of Wild Horses is misinformation at best — PZP is inconsistent and leads to extinction . . .
*The fact is PZP reduces reproductive rates in America’s Wild Horses – and as good science tells us, creates a decrease in Wild Horse population by lower reproductive-rates in many mammals. **The fact is PZP speeds-up what is termed a “closure-rate.” When using good science and good research derived from a thorough data base, this equates to Extinction of America’s Wild Horses – Beyond any doubt! Although competition among individuals is reduced at low densities and can induce a population rebound, a counter-phenomenon known as the ‘‘Allee effect’’ can also act to draw populations more so toward extinction by (for instance) disrupting behavioral patterns, which depend on numbers (e.g., herd defense against predators; genetics and available learned characteristics, for example to establish firm survival skills from aged horses, et al. ); or by genetic threats such as inbreeding depression. Small populations, where most of the wild horse herds are at currently – very low non-viable or near non-viable numbers per herd/band, if dominated by chance events combined with the Allee effects, are often considered to have dipped below their ‘‘minimum viable population’’ size. Thereby, debate toward compensatory effect, or the Allee effects due to small herd size no longer is a viable deduction what so ever – due to so many other infringement processes conducted on the wild horses while on their designated lands by Law; also, due to the inconsistent Registered Pesticide PZP throughout its history. But many researchers and others surmise its use, and believe the inconsistent results were known, and to the effect toward a quasi misinformation campaign to promote the Registered Pesticide as a useful anti-reproductive process for the control of wild horses – or in truth of the matter the process to extinction of America’s wild horses . . . Yes, the truth is nothing more than a known lie by those who wanted the wild horses destroyed completely in the name of being a nuisance or pest, and with no redeemable characteristics what so ever – this equates to judgments based on unsubstantiated data, which equates to hatred toward wild horses – your tax money being used under false pretense by government agencies catering to special interests! Thus, once a major population decline has occurred (from habitat loss, overexploitation, or in response to many other possible stressors), an ‘‘extinction vortex’’ of positive feedback loops can doom species to extinction, even if the original threats have been alleviated. Further, many species may take decades to perish following habitat degradation, but with so many stressors the wild horse herds confronted with and attacks on them now weekly, and their low numbers, extinction is eminent. Categorically right now the America’s Wild Horses are, by many government agencies, supporting as a priority the “Living Dead” paradigm – as seen by the ignoring of public response and completing the tasks of the Stressors outlined above, undaunted. . . The eventual loss of such species, as wild horses on Public Lands is referred to as the ‘‘extinction debt’’ caused by past habitat loss. For example, even if net rates can be reduced or even halted, the extinction debt of remnant and secondary lands patches will see the extinction of countless remaining species over this interval. We can now speak more about the attrition situation, other than the wild horse dilemma, and acknowledge our government’s attempts at ridding America’s entire Public Lands of many more animals, or even a priority toward all wildlife . . .
Certain life-history along with behavioral, morphological, and physiological characteristics appear to make some species more susceptible than others to the extinction drivers described above. In general, large-sized species with a restricted distribution that demonstrate habitat specialization tend to be at greater risk of extinction from human’s, more so than other stressor’s within their respective Taxa, especially to processes such as rapid habitat loss combined with reproduction . Because of their high habitat specificity and/or low population densities, rare species may be more prone to extinction than common species. The size of a species’ range is also a major determinant of its extinction proneness. Small ranges may make species more vulnerable to stochastic perturbations, even if local abundance is high; for example, proportionally more passerines (perching birds) with relatively small geographic ranges. Such trends are worrisome because those species with shrinking ranges as a result of adverse human activities become particularly vulnerable to other drivers, such as climate change. Habitat loss also reduces the patch sizes necessary for species requiring large home ranges, making them vulnerable to extinction from a loss of sub-population contentedness, reduced dispersal capacity, and the ensuing lower population viability. Larger-bodied vertebrates are considered to be more extinction-prone than smaller bodied ones when the threatening process unfolds rapidly or intensely. Indeed, threatened mammals are an order of magnitude heavier than non-threatened ones. A common explanation for this trend is that body size is inversely correlated with population size, making large-bodied animals less abundant and more vulnerable to chronic Environmental perturbations (while being buffered against short-term environmental fluctuations). The extinction proneness of large-bodied animals to human activities is further enhanced because of other correlated traits, such as their requirement of large area, retarded food intake, high habitat specificity, and lower reproductive rate. Beyond a doubt, all of the above lead America’s Wild Horses to Extinction. And the government employees, contractors, and Registered Pesticide PZP promoters are guilty also . . . despite their ongoing misinformation to the public and taxpayer’s alike. Those who debate these facts, such as those who make their living accepting grants or government contracts and adhere to what they call acceptable practice, while using the Registered Pesticide PZP on the Wild Horses, also have as much vented interest as do welfare ranchers, BLM, DOI, and corporations who make money off the occasion and off of America’s Public Lands. The bottom line is they are being subsidized via antiquated laws while doing so, lying and distributing misinformation to the public. The best example is the overly estimated Wild Horse populations on America’s Public Lands and given to the public by BLM . . . Many questions need to be answered, especially from the BLM, the DOI, and the WH&B Board themselves. These organizations hide the truth, or simply give the public outright misinformation and often lie. The extinction juxtaposition of much of American wildlife, directly involving significant links, for example wolves, cougars, and other predators that provide reforestation and environmental enhancements simply by their inhabiting a particular area, are much less active right now, and nearing extinction as well. This is becoming more noticeable within our environmental crisis as well, and for many reasons. But there is one more note of interest to be developed here, that is of expense – how much has the taxpayer paid in order to pave the way in making Wild Horses Extinct – and why, when they can get along well enough on Public Lands, without any problems at all due to the sheer number of land-size compared to wild horse herd size – other than those made up problems and by 100% of those who profit vastly on Taxpayer money, in the billions now yearly, and the Taxpayer receives = 0 (that is Zero Folks) Nothing! Allee effects. These factors cause a reduction in the growth rate of small populations as they decline (e.g., via reduced survival or reproductive success).coextinction. Extinction of one species triggers the loss of another species. extinction debt. This refers to the extinction of species or populations long after habitat alteration. extinction vortex. As populations decline, an insidious mutual reinforcement occurs among biotic and abiotic processes driving population size downward to extinction. extirpation. This refers to extinction of a population rather than of an entire species. invasive species. These are nonindigenous species introduced to areas outside of their natural range that have become established and have spread. megafauna. This refers to large-bodied (>44 kg) animals, commonly (but not exclusively) used to refer to the large mammal biota of the Pleistocene. minimum viable population. This is the number of individuals in a population required to have a specified probability of persistence over a given period of time. *** Ironically, and with the use of up to millions of dollars of taxpayer money over the years, the Wild Horse and Burro Board was developed by a congressionally voted upon (unanimously at that time) Law, to safeguard America’s Wild Horses. *** Ironically again, this WH&B Board (i.e. contrary directly to Law) indeed does not and has not for quite some time protected the Wild Horses on Public Lands what so ever. ***A perusal of the WH&B Act Law and the WH&B Board decisions (Board Meeting Documents over the years) demonstrate this to be a fact, and in accord with the Bureau of Land Management and the Department of the Interior’s blessing, have indeed spent millions in taxpayer money illegally, as well as violated consistently the Wild Horse and Burro Act – also a unanimously and Congressionally voted upon Law which demonstrated the will of the majority of the American people when done . . .
*** So what started out to be a safeguard for America’s Wild Horses, was corrupted decades ago, and was infiltrated with people from the areas the Wild Horses and Public Lands in question were to be protected “From”! PROBLEM! *** Ultimately, and well referenced, the WH&B Board decisions based upon getting rid of, or classified as on the road to Extinction, and via a loosely configured time element, all of America’s Wild Horses taken off of America’s Public Lands – Preferred Methodology = EXTINCTION – conducted with Invasive Species X Reproduction Breed-Control (i.e. PZP-Registered Pesticide)! THE SCAM! Brook, Barry W., Navjot S. Sodhi, and Peter K. L. Ng. 2003. Catastrophic extinctions follow deforestation in Singapore. Nature 424: 420–423. Clavero, Miguel, and Emili Garcia-Berthou. 2005. Invasive species are a leading cause of animal extinctions. Trends in Ecology and Evolution 20: 110. Dirzo, Rudolfo, and Peter J. Raven. 2003. Global state of biodiversity and loss. Annual Review of Environment and Resources 28: 137–167. Fagan, William F., and E. E. Holmes. 2006. Quantifying the extinction vortex. Ecology Letters 9: 51–60. Koh, Lian P., Robert R. Dunn, Navjot S. Sodhi, Robert K. Colwell, Heather C. Procter, and Vince S. Smith. 2004. Species co-extinctions and the biodiversity crisis. Science 305: 1632–1634. Pimm, Stuart L., and Peter Raven. 2000. Extinction by numbers. Nature 403: 843–845. Jamie A. Consuegra, Michael P. L. Fogden, Pru N. Foster, Enrique La Marca, Karen L. Masters, Andres MerinoViteri, Robert Puschendorf, Santiago R. Ron, G. Arturo Sanchez-Azofeifa, Christopher J. Still, and Bruce E. Young. 2006. Widespread amphibian extinctions from epidemic disease driven by global warming. Nature 439:161–167. Ricketts, Taylor H., Gretchen C. Daily, Paul R. Ehrlich, and C. D. Michener. 2004. Economic value of tropical forest to coffee production. Proceedings of the National Academy of Sciences U.S.A. 34: 12579–12582. Rosser, Alison M., and Sue A. Manika. 2002. Overexploitation and species extinctions. Conservation Biology 16: 584–586. Sekercioglu, Cagan H., Gretchen C. Daily, and Paul R. Ehrlich. 2004. Ecosystem consequences of bird declines. Proceedings of the National Academy of Sciences U.S.A. 101: 18042–18047. How large will be the loss of America’s Wild Horses on America’s Public Lands? Over what time period might that loss unfold? Habitat destruction and breed control is the leading cause of species extinction, and here we can actually see cattle, a distinct overabundance, being the problem on Public lands; which, leads to not only environmental destruction, but wildlife and in particular wild horse extinction! Generally, many of the species found across large areas of a given habitat are represented, most often anyway, within smaller areas. So we can consider habitat loss initially causes few-extinctions. Then we go to cattle . . . then discover there are so many that the last remnants of Public Lands habitat are essentially being destroyed. Thus, at current rates of habitat destruction, the common belief is the peak of extinctions should not occur for decades – Unfortunately, what does exist is an uneven, highly clumped, distribution of vulnerable species over America’s public land surface. Within these ‘biodiversity hotspots (HMA’s in the matter of this discussion), habitats are already disproportionately reduced. 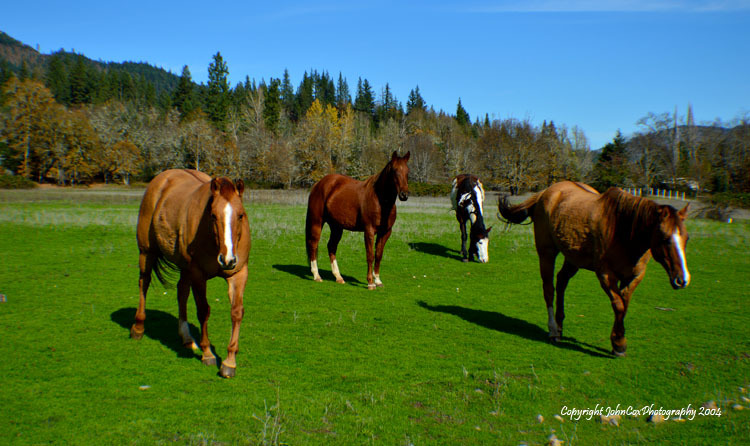 Wild Horses are in danger of becoming extinct! Conservatively, there are about seven million species of animals — a definition encompassing most organisms that would be generally recognized as plants or animals but excluding bacteria, for instance — about 85% are terrestrial – wild horses such a small percentage, yet blamed for so much “occurrence” on Public Lands – outright lies actually, to defend the over abundance of cattle and other grazing livestock on Public Lands. Humanity is rapidly destroying habitats that are most species-rich. To convert habitat loss to species loss, the principles of island ecology (HMA’s being an island for example within this paradigm of explanation) are applied to the terrestrial ‘islands’ that remain in a ‘sea’ of converted land. The relationship between number of species and island area is nonlinear, and from this one can predict how many species should become extinct as the size of the islands shrinks. These doomed species do not disappear immediately, however.
. . . i.e. many horse bands and herds, the extinction percentage increases 100-fold, and quickens the process to eventually a shorter-time-span of reaction-to-action curve – or extinction within just a few years . . . The Wild Horses on Public lands is foremost in this matter, as well as wolves, bears, and cougars, as being destroyed — apparently a priority for the ignorant, the politicians that feed upon fear and hate, and those who simply follow such ravings – which are nothing more than distorted and disgusting lies brought about by Special Interest groups and lunatics. Because the species–area curve is non-linear, the clearing to date (or the overwhelming destruction of Public Lands from cattle) of much of America’s Public Lands, are predicted to eliminate 42% of the species that they contain (some scientists predict much higher numbers as well as much faster). The time delays before extinction mean that many more species should be ‘threatened’ than have already become extinct; that is, they are thought likely to become extinct in the wild in the medium-term future. For example with the elimination of wild horses, wolves, cougars, et al., at least 12% of all plants and 11% of all birds will come into this category as well. Of course, more cattle onto Public Lands x2 would eliminate the other 85% of species that they contain. The extinction curve should accelerate rapidly to a peak by a decade or two if the rate of livestock increase and destruction of Public Lands remains constant. But it will be upon us sooner if that rate increases as it has been for a few years now — as seems probable. Oddly Beef remains at 28% product thrown away (not consumed), with 4% thrown away in commercial process, and another 7% lost in transport – Yes, we apparently have an over-abundance of beef in America . . .
Once the extinction peak has passed, the extinction curve declines, perhaps into the twenty-second century as species are lost from the remaining fragments of habitat. The relative height of the peak depends critically on the amount of habitat that remains. A value of 5% of remaining habitat would protect about 50% of all the Public Lands species; smaller percentages would lead to smaller estimates of surviving species. Habitat destruction areas remain blatantly obvious — Species found only within the areas are themselves destroyed, then eliminated, just as the habitat around them. One observation interesting, when we considerer HMA’s within a biological paradigm – whereby, species with small ranges are typically scarcer within their ranges than are more widely distributed species, making them yet more vulnerable. Consequently, even random destruction would create centers of extinction that match the concentrations of small-ranged species — the hotspots. So the ideology of the HMA’s on Public Lands, when first developed were very protective areas, but when manipulated, in this case for Special Interests, these HMA’s become burdensome, even dangerous to the Wild Horses as well as other animals moving toward extinction . . . Look at the term Feral once out of an HMA – a term changed with the WH&B Act to accommodate welfare ranching is all . . . Worse, however, the HMA’s destruction, as it becomes obvious through consistency, may not have been random at all — rather malevolent. In the HMA areas designated as Wild Horse Safety Zones basically, cattle, rather than Wild Horses become the majority influence upon the Public Lands areas just by sheer numbers alone; only 12% of the original primary vegetation remains within many of the cattle grazing permit areas, compared with about 50% Public Lands as a whole. Ironically, even within those HMA’s, the areas richest in endemic plant species — species that are found there and only there and only cattle graze and horses do not graze — have proportionately the least remaining vegetation and the smallest areas currently protected. Applying the species–area relationship to the individual hotspots gives the prediction that 18% of all their species will eventually become extinct if all of the remaining habitats within HMA’s were quickly protected. These HMA’s, deductively, would eventually lose about 40% of all their species. All of these projections ignore other effects on biodiversity, such as the possibly adverse impact of global warming, and further introduction of more alien species, for example sheep or goats, which is a well-documented cause of extinction of native species as well. Elk, for example, have obtained a virus from Goats feces that are fatal to Elk, et al and the virus transmitted through other infected Elk . . . Yet Cougar and Wolves blamed for Elk destruction – demonstrates beyond a doubt the iron-clad grip of lies and ignorance within our management of wildlife today . . . Unless there is immediate action to salvage the remaining and currently unprotected HMA’s and Wild Horses and their areas, the species losses will more than double. 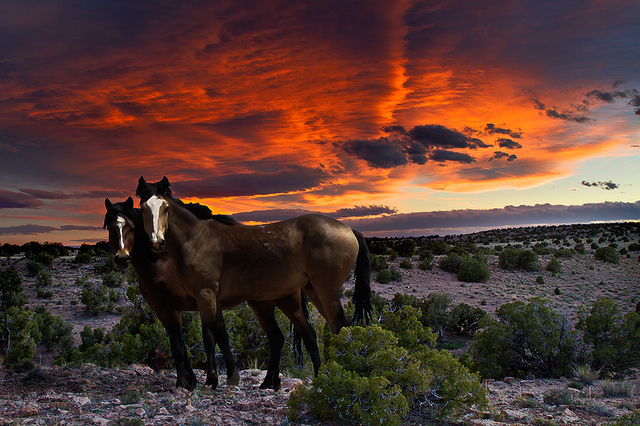 When this happens the Wild Horses will be Extinct – NONE LEFT! There is, however, a glimmer of light in this gloomy picture. High densities of small-ranged species make many species vulnerable to extinction. But equally this pattern allows both minds and budgets to be concentrated on the prevention of nature’s untimely end. Protecting them is necessary, but not sufficient – consider they are supposedly protected currently, but that is the lie of all lies – as Wild Horses are not protected at all! Unless we as a civilization start considering the “truth” rather than lies of convenience for the wealthy and special interests, we will see not only wild horses become extinct, but many, many other wildlife as well as many other environments / biospheres – Conclusively, ignorance is not the path toward humane reasoning – rather, truth is the pathway to sound judgment, good management, and prolific living circumstances in America and abroad . . .
And need I say, the ability to walk out into nature, into areas with wild life, horses, predators and everything we dream about that exits, and actually pause for a moment and see them alive, in their habitat – being as one – with nature . . .
Myers, N. , Mittermeier, R. A. , Mittermeier, C. G. , da Fonseca, G. A. B.& Kent, J. Nature 403, 853–858 (2000). May, R. M. in Nature and Human Society (ed. Raven, P. H.) (Natl Acad. Sci. Press, Washington DC, 2000). Raven, P. H. (ed.) Research Priorities in Tropical Biology (Natl Acad. Sci. Press, Washington DC, 1980). Nepstead, D. C. et al. Nature 398, 505–508 (1999). Cochrane, M. A. et al. Science 284, 1832– 1835 (1999). Brooks, T. M. , Pimm, S. L. & Collar, N. J. Conserv. Biol. 11, 382– 384 (1997). Brooks, T. M. , Pimm, S. L. & Oyugi, J. O. Conserv. Biol. 13, 1140– 1150 (1999). Pimm, S. L. , Russell, G. J. , Gittleman, J. L. & Brooks, T. M. Science 269, 347–350 ( 1995). Walter, K. S. & Gillett, H. J. IUCN Red List of Threatened Plants (IUCN, Gland, Switzerland, 1998). Collar, N. J. , Crosby, M. J. & Stattersfield, A. J. Birds to Watch 2 (Smithsonian Inst. Press, Washington DC, 1994). McAllister, D. , Schueler, F. W. , Roberts C. M. & Hawkins, J. P. in Advances in Mapping the Diversity of Nature (ed. Miller, R.) 155–175 (Chapman & Hall, London, 1994). Evidence of rapid change in genetic structure and diversity during range expansion in a recovering large terrestrial carnivore Proc R Soc B 22 May 2015: 20150092. Evolving through day and night: origin and diversification of activity pattern in modern primates Behav Ecol 1 May 2015: 789-796. Ongoing unraveling of a continental fauna: Decline and extinction of Australian mammals since European settlement Proc. Natl. Acad. Sci. USA 14 April 2015: 4531-4540. Towards a general framework for predicting threat status of data-deficient species from phylogenetic, spatial and environmental information Phil Trans R Soc B 19 February 2015: 20140016. Effects of logging, hunting, and forest fragment size on physiological stress levels of two sympatric ateline primates in Colombia Conservation Physiology 28 October 2014: cot031. Collapse of an ecological network in Ancient Egypt Proc. Natl. Acad. Sci. USA 7 October 2014: 14472-14477. Phylogenetic signal in extinction selectivity in Devonian terebratulide brachiopods Paleobiology 1 September 2014: 675-692. Predictors of contraction and expansion of area of occupancy for British birds Proc R Soc B 7 July 2014: 20140744. Rodents of the Caribbean: origin and diversification of hutias unravelled by next-generation museomics Biol Lett 1 July 2014: 20140266. Low functional redundancy among mammalian browsers in regulating an encroaching shrub (Solanum campylacanthum) in African savannah Proc R Soc B 22 June 2014: 20140390. Drivers of extinction risk in African mammals: the interplay of distribution state, human pressure, conservation response and species biology Phil Trans R Soc B 26 May 2014: 20130198. The evolutionary reality of higher taxa in mammals Proc R Soc B 22 May 2014: 20132750. Declines in large wildlife increase landscape-level prevalence of rodent-borne disease in Africa Proc. Natl. Acad. Sci. USA 13 May 2014: 7036-7041. Ecological correlates of vulnerability to fragmentation among Afrotropical terrestrial small mammals in northeast Tanzania J Mammal 15 April 2014: 269-275. Predation selectively culls medium-sized species from island mammal faunas Biol Lett 1 April 2014: 20131066. Status and Ecological Effects of the World’s Largest Carnivores Science 10 January 2014: 1241484. Extinction risk and conservation of the world’s sharks and rays elife 1 January 2014: e00590. Phylogenetic correlates of extinction risk in mammals: species in older lineages are not at greater risk Proc R Soc B 3 July 2013: 20131092. Traits, trees and taxa: global dimensions of biodiversity in mammals Proc R Soc B 22 December 2012: 4997-5003. Climatic backdrop to the terminal Pleistocene extinction of North American mammals Geology 1 November 2012: 1023-1026. Biodiversity loss decreases parasite diversity: theory and patterns Phil Trans R Soc B 19 October 2012: 2814-2827. Parasite invasion following host reintroduction: a case study of Yellowstone’s wolves Phil Trans R Soc B 19 October 2012: 2840-2851. Reconstructing past species assemblages reveals the changing patterns and drivers of extinction through time Proc R Soc B 7 October 2012: 4024-4032. Life history predicts risk of species decline in a stochastic world Proc R Soc B 7 July 2012: 2691-2697. Habitat tracking, stasis and survival in Neogene large mammals Biol Lett 23 February 2012: 64-66. The changing fates of the world’s mammals Phil Trans R Soc B 27 September 2011: 2598-2610. Prioritizing conservation investments for mammal species globally Phil Trans R Soc B 27 September 2011: 2670-2680. Reconciling global mammal prioritization schemes into a strategy Phil Trans R Soc B 27 September 2011: 2722-2728. The key elements of a comprehensive global mammal conservation strategy Phil Trans R Soc B 27 September 2011: 2591-2597. Global patterns of fragmentation and connectivity of mammalian carnivore habitat Phil Trans R Soc B 27 September 2011: 2642-2651. Mapping and navigating mammalian conservation: from analysis to action Phil Trans R Soc B 27 September 2011: 2712-2721. The ghosts of mammals past: biological and geographical patterns of global mammalian extinction across the Holocene Phil Trans R Soc B 12 September 2011: 2564-2576. Ecology and evolution of mammalian biodiversity Phil Trans R Soc B 12 September 2011: 2451-2461. Predicting how populations decline to extinction Phil Trans R Soc B 12 September 2011: 2577-2586. Phylogenetic conservatism of environmental niches in mammals Proc R Soc B 7 August 2011: 2384-2391. Rarity as a life-history correlate in Dudleya (Crassulaceae) Am. J. Bot. 1 July 2011: 1104-1112. Correlates of Vertebrate Extinction Risk in Canada BioScience 1 July 2011: 538-549. Unexpected patterns of fisheries collapse in the world’s oceans Proc. Natl. Acad. Sci. USA 17 May 2011: 8317-8322. Unravelling the structure of species extinction risk for predictive conservation science Proc R Soc B 7 May 2011: 1329-1338. The bigger they come, the harder they fall: body size and prey abundance influence predator-prey ratios Biol Lett 23 April 2011: 312-315. Primate extinction risk and historical patterns of speciation and extinction in relation to body mass Proc R Soc B 22 April 2011: 1256-1263. Correlates of rediscovery and the detectability of extinction in mammals Proc R Soc B 7 April 2011: 1090-1097. Beyond Predictions: Biodiversity Conservation in a Changing Climate Science 1 April 2011: 53-58. Bird population trends are linearly affected by climate change along species thermal ranges Proc R Soc B 7 December 2010: 3601-3608. Quantitative Traits and Diversification Syst Biol 1 December 2010: 619-633. Population and geographic range dynamics: implications for conservation planning Phil Trans R Soc B 27 November 2010: 3743-3751. Phylogenetic diversity does not capture body size variation at risk in the world’s mammals Proc R Soc B 22 August 2010: 2435-2441. Extreme contagion in global habitat clearance Proc R Soc B 7 April 2010: 1081-1085. World System, Anthropogenic, and Ecological Threats to Bird and Mammal Species: A Structural Equation Analysis of Biodiversity Loss Organization Environment 1 March 2010: 3-31. Multiple ecological pathways to extinction in mammals Proc. Natl. Acad. Sci. USA 30 June 2009: 10702-10705. Life on the edge: carnivore body size variation is all over the place Proc R Soc B 22 April 2009: 1469-1476. High variability in patterns of population decline: the importance of local processes in species extinctions Proc R Soc B 7 January 2009: 63-69. The Status of the World’s Land and Marine Mammals: Diversity, Threat, and Knowledge Science 10 October 2008: 225-230. Phylogenetic trees and the future of mammalian biodiversity Proc. Natl. Acad. Sci. USA 12 August 2008: 11556-11563. The Evolution and Distribution of Species Body Size Science 18 July 2008: 399-401. A Significant Upward Shift in Plant Species Optimum Elevation During the 20th Century Science 27 June 2008: 1768-1771. The predictability of extinction: biological and external correlates of decline in mammals Proc R Soc B 22 June 2008: 1441-1448. Higher origination and extinction rates in larger mammals Proc. Natl. Acad. Sci. USA 22 April 2008: 6097-6102. The island rule: made to be broken? Proc R Soc B 22 January 2008: 141-148. Accumulation of slightly deleterious mutations in mitochondrial protein-coding genes of large versus small mammals Proc. Natl. Acad. Sci. USA 14 August 2007: 13390-13395. Selective extinction of late Neogene bivalves on the temperate Pacific coast of South America Paleobiology 1 June 2007: 455-468. Late Holocene extinction of Puerto Rican native land mammals Biol Lett 22 April 2007: 193-196. Improving the Key Biodiversity Areas Approach for Effective Conservation Planning BioScience 1 March 2007: 256-261. Early Penguin Fossils, Plus Mitochondrial Genomes, Calibrate Avian Evolution Mol Biol Evol 1 June 2006: 1144-1155. Latent extinction risk and the future battlegrounds of mammal conservation. Proc. Natl. Acad. Sci. USA 14 March 2006: 4157-4161.